Very friendly and helpful staff. Loved the river to swim in. Unique in Europe! 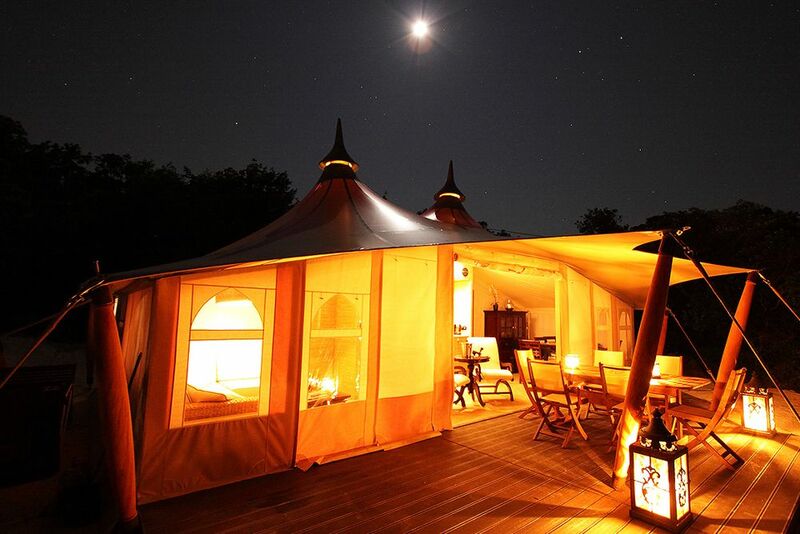 Camping in a luxury design tent in a fairytale setting. Specially designed for campers who want to enjoy themselves in style and in optimal comfort. The living area is no less than 60m² including the covered patio. There are two bedrooms, two bathrooms and two separate toilets! The stylish furnishings and beautiful wooden floors will immediately make you feel at home. You can make yourself a delicious Nespresso in no time in the modern kitchen. Enjoy your freshly made coffee in the comfortable sun lounger on the spacious patio. Let the sun’s rays warm you up and take in the beautiful views from Campsite La Vallée Verte. You can rent the unique RoyalLodge at this regally located campsite in the South of France. The RoyalLodge’s eye-catcher is the beautiful colonial dresser which contains your modern crockery. And your family can enjoy a meal in comfort at the imposing colonial dining table. The surroundings lend themselves perfectly to culinary trips out, for example to Châteauneuf-du-Pape or Avignon. You are only 30 minutes away from enjoying an exclusive meal at a Michelin star restaurant. So you can turn this into a culinary adventure! Having enjoyed a wonderful evening you can sleep like a princess under Egyptian satin bedding. Your comfortable mattress will make you feel you have been born again the next morning. Besides which the airconditioning will ensure a pleasant temperature. To start off the new day you can enjoy a refreshing rain shower in the lovely bathroom. Everything has been thought of: hair dryer, shaver socket, large mirror and ventilation. Time for a good book? Take your place in the modern lounge corner made from banana leaves. The lovely standard lamp will provide you with enough light in the evening. You can of course relax and watch a film on the flatscreen TV in your bedroom. This campsite is the ideal setting for a holiday full of variety. You are here at the crossroads of the Ardèche, the Cévennes and Provence. That means: beautiful countryside, waterfalls, gorges such as the Gorges de l’Ardèche, lovely French villages and the vineyards of the Rhône valley. What can RoyalLodge offer you? Lay-out Parents’ bedroom with a double bed (160 x 210 cm) with luxurious 35 cm deep mattresses, built-in stereo flatscreen TV with DVD and CD player, wardrobe and private bathroom with spacious shower and a separate toilet. The second bedroom has two single beds (80 x 210 cm) with 25 cm extra deep mattresses. Regarding fittings this bedroom is identical to the parents’ bedroom. There is a lounge corner in the living area with a table and a designer lamp for easy relaxation. The modern open kitchen with built-in fridge, dishwasher and Nespresso machine is provided with every convenience. The eye-catcher of the open kitchen is the beautiful colonial dresser which contains your modern crockery. Your family can enjoy a meal in comfort at the imposing colonial dining table. There is a spacious patio outside with a table and luxurious wooden loungers so you can soak up the sun. From £ 685 a week!